Just reviewed CoreLogic’s Home Price Insights monthly report for July 2018. They have made a determination based on their numbers that home prices were up in July by 6.2 percent over July 2017. But they also make a statement that existing homeowners feel they are in a “sellers” market and are staying put for higher returns on their home sale. So, it sounds like the rapid home buying pace we had when interest rates were lower may begin to cool off now that the Fed has been raising interest rates in the effort to slow the economy down, so we don’t have a run-away economy like the 80’s. This could be a good thing for younger first-time home buyers who are trying to get into their beginner homes and who are being priced out of most markets. The study assessed attitudes toward homeownership and the drivers of the home buying or renting decision process. The data reveals that 50 percent of the top 50 markets are considered overvalued. However, residents in many of these high-price growth markets have expectations that might be at odds with this realty. The graph below shows that 62 percent of residents in these markets expect their homes will be worth more in three years than they are today. 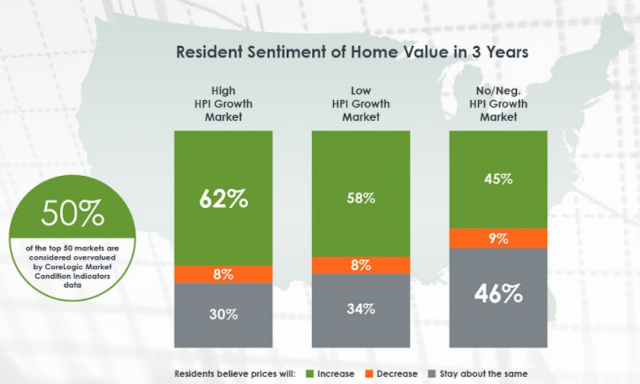 Meanwhile, 55 percent of resident in no/negative growth markets believe their home will be worth either the same or less in three years then they are today. Additionally, 47 percent of residents in high-price growth markets and 31 percent in lower growth markets feel they are in a “sellers” market. As for South Carolina, the change in home value between July 2017 and July 2018 was 5.1 percent. The projection for July 2019 is 5.6 percent higher. Month over month percent increase is showing an actual of.1 percent and projected 0.4 percent. Our closest Top U.S. Metro area, Washington, D.C. is now showing a 2.6 percent home price index change over the same time last year. The latest market conditions indicators Metro area maps for July 2018 is showing Greenville-Anderson-Mauldin as overvalued and that trend will continue into July 2023. Our neighboring metro area to the north Spartanburg is showing normal valuation which will continue into July 2023. Columbia metro area continues to be undervalued. While the coastal areas of Charleston, North Charleston, Hilton Head Island, Bluffton and Beaufort continue to be overvalued. So, the impact of this report is that home sellers are choosing to stay put believing that their home will be worth more if they sell it three years from now. But before you make this decision take some factors into account. What will the Fed be doing with interest rates over the next three years, will new home building increase as builders become more confident that they will have buyers and with a change in inventory will home prices really rise that much more than they are today? Obviously, if you are a homeowner it is your decision on when to sell but why not contact me, your local expert, and let’s have a conversation about what the market is doing here in Greenville and if the market indicators will change that much here locally. CoreLogic provides numbers nationwide and concentrate their efforts on the larger metro areas. Greenville, although large, may not “feel” the same results as Washington, D.C.